Our first quarterly Dream Board Fundraiser was a tremendous success! With all of our donations and an additional contribution from Dawn's Dream, we were able to donate $1,700 to this amazing organization. 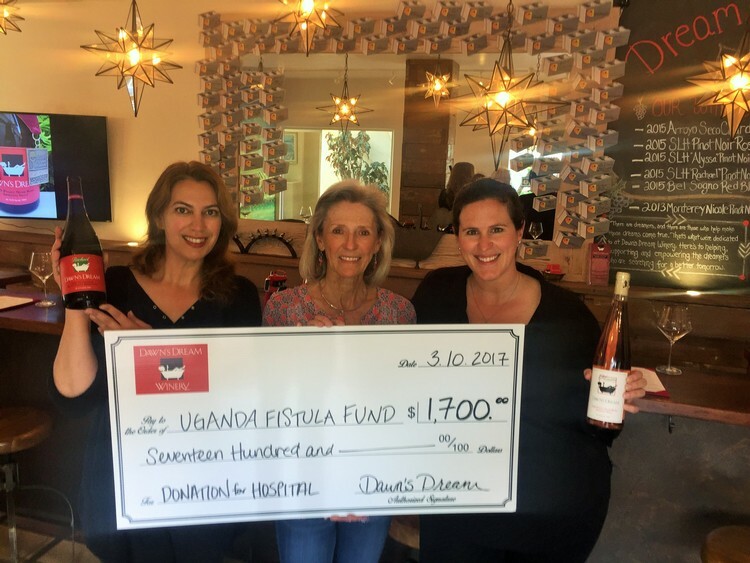 The Uganda Fistula Fund is raising money to build a hospital in Uganda for the women suffering from obstetric fistula and to work towards fistula prevention across Uganda. We want to personally thank each one of you who made any contribution during this time. For more information on the Uganda Fistula Fund, please visit their website at https://www.ugandafistulafund.org/. Our next quarterly Dream Board Fundraiser will take place in April to raise money for the Women's Fund of Monterey County. Stay tuned for more information! The holidays are a difficult time for foster children and one of the most painful issues for them is not being able to acquire gifts to give to their foster parents and family members. We are delighted to partner with our neighbors, Thinker Toys, the most historical toy store in all of Monterey County, and with the fashionable & fun clothing store, Ms Fabulous, to provide gifts for children, teens and adults in support of Voices for Children. Thinker Toys will be offering 25% off any items purchased for this cause between November 1st through December 24th. Ms. Fabulous will be offering 10% off any item purchased between November 1st through December 24th. 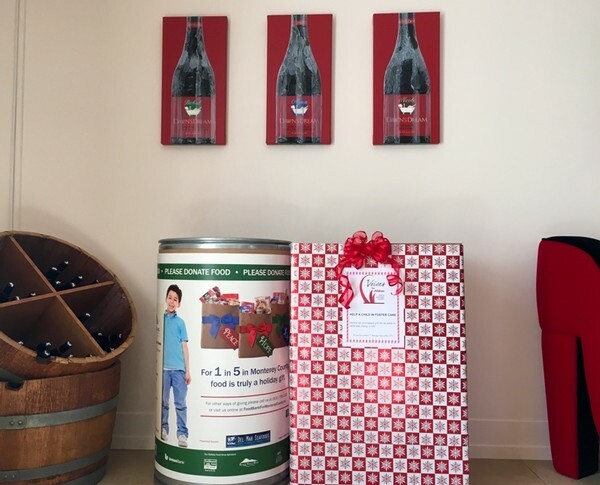 Dawn’s Dream will be offering a $10 voucher to spend at the tasting room any way you like: wine flights, bottles of wine, retail items when you bring-in any unwrapped gift and a non-perishable food item from November 1st through December 24th. In addition to the festive atmosphere that charitable giving provides, we will be offering live holiday music, delicious light fare, and, of course, your favorite wines! Please contact Sara with any questions. I wanted to take a few moments to fill-you-in about some important changes taking place at the tasting room regarding our wonderful staff. Being members of our extended family, many of you have gotten to know Maegan Kohn over the past two years. Maegan has been an absolutely indispensable presence on our team as tasting room manager, event organizer, administrative miracle-worker, frequent hostess behind the bar, and all-around Wonder Woman! I don't know what I would have done without her as we worked to build the "business" of Dawn's Dream in so many exciting facets, striving to bring all of you the best customer-service experience possible and keep you coming back for more. Maegan's professionalism and wonderful disposition have been treasured assets to all of us, and we hope you feel the same way about her. All of this, of course, makes saying "Goodbye" a bittersweet proposition! Maegan is, in fact, leaving us this coming Monday to pursue a "can't resist" endeavor in the wine industry in Morgan Hill. I'm sad to see her move on, but as a woman who has been in business on my own for over twenty years, I know quite a bit about the ebb and flow of the working world. It's a natural and necessary part of achieving personal opportunity and growth in our great country, whenever we see friends and associates open new doors, meet goals, or accept new challenges and keep on reaching for the very best. I am thrilled for Maegan and her new adventure, and wish her all the success in the world, knowing she'll be a big hit because I have seen how diligently she strives for excellence. Please join me in wishing her a fond farewell and, if you happen to be in town, don't hesitate to drop by the tasting room over the weekend and extend your wishes to Maegan, personally. It will be difficult for anyone to fill her shoes, but I'm pleased to announce that the search for a new Manager for our Sales, Tasting Room and Administration is officially "on" and the prospect of meeting new, eminently qualified individuals and aspirants is an adventure for me, too. In the meantime, thanks to all of you for taking those valuable moments to keep dreaming along with us in the ever-changing, wonderful, WINE-ful world! At Dawn's Dream we're always looking for new ways to help ourselves and our friends attain dynamic levels of growth in the pursuit of balanced, successful lifestyles. 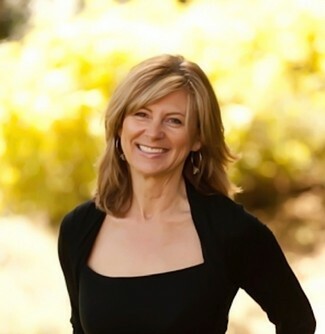 With that in mind, we are thrilled to announce that Diane Danvers Simmons, founder of Own It, Feel It, Live It! is teaming up with the winery for an extraordinary series of workshops on June 26-27th! Diane’s Spirituality in Stilettos (SIS) workshops highlights the power of mind, body, spirit, and unity to promote total well-being for a happier, healthier life. SIS is a multidimensional approach blending the best of East and West to help women nourish and enrich their everyday lives while remaining grounded in their own truth and style. Diane is passionate about creating a movement of positive change and growth for all women. Dawn is passionate about supporting women whose business goals include the empowerment of other women. Could there be a more harmonious meeting of the minds? We don't think so, and we're excited about sharing the power of this experience with you! 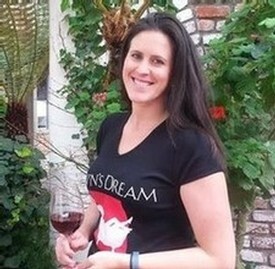 Things kick-off early Friday evening, June 26th, at Dawn's Dream Winery, where you'll have the opportunity to meet Diane Danvers Simmons in person while enjoying delectable wine-tasting flights and sumptuous appetizers during an Introduction and Info session. This reception will feature lots of camaraderie and some interactive exercises intended to prepare you for the Spirituality in Stilettos workshop, demonstrating what a powerful difference can be made when we come together and support each other in a common goal. Amid the splendor of the Galante Ranch & Winery in Carmel Valley, a full day with Diane Danvers Simmons and her Spirituality in Stilettos workshop begins! Overlooking the lush vineyards and surrounding grandeur of the mountains, a number of empowering sessions and activities are planned. Diane created her Spirituality in Stilettos workshops to be held in beautiful indoor & outdoor environments so that a safe haven can be created, affording women the time to reinvest in themselves. In this way, women will be reminded that health and happiness cannot be separated from what we eat, what we feel, what we do, and what we think at any phase of life. The series flows into three parts, all of which bring the essence of Own it, Feel It, Live It to incandescent life through fun, insightful activities in Mother Nature, unique interactive exercises, journaling, yoga, meditation, sensory awareness, and discussion ... along with some surprises! A marvelous farm-to-table lunch will be served for everyone's pleasure and the day's workshop will conclude with Dawn hosting a personal wine-tasting in the peaceful coolness of the Galante wine caves. A4:30-5:00pm drive back to Carmel is scheduled to follow. This is an event you won't want to miss, Ladies -- an affirming and enlightening opportunity to explore the strengths of a full-spectrum approach to life and demonstrate what a powerful difference can be made when we come together and support each other in a common goal. Diane is offering this once in a lifetime retreat experience at the special introductory rate of $425/person. This unique event featuring the majesty of fine food, wine, and spiritual wisdom is sure to sell-out quickly, so contact Diane by email or phone at (775) 287-3679 to make your reservations as soon as possible. For more information about Diane Danvers Simmons and her wonderful work with Own It, Feel It, Live It, feel free to visit her official website. Remember when Merlot was all the rage? 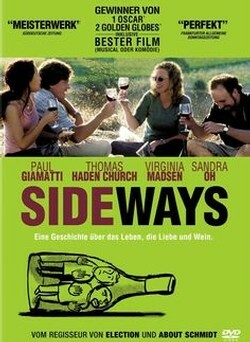 That was until the movie ‘Sideways’ was released in 2004 when the lead character adamantly refused to drink Merlot, slandering the varietal’s name. This led to a large decline in the purchase of Merlot, referred to as, ‘The Sideways Effect’. The reality of ‘The Sideways Effect’ is that it is based completely on the Power of Suggestion. Our society is influenced in our wine selections just as in regular life by the media, Hollywood, and expert opinions. This translates to the wine world in the form of wine magazines, wine movies and documentaries, and sommeliers and wine ratings. We depend on these outlets to tell us the new wine trends, the popular varietals, and what vintages or pairings cannot be missed. While sometimes the ratings, expert opinions, or lengthy articles can be very informative and help you find a new pairing or varietal that you would not have sampled otherwise, they are not the most crucial factors in deciding which wines you should pursue and drink. THE important factor is: What do YOU like? It doesn’t matter if a bottle of wine is $5 or $500…if you like it, then it is a good bottle of wine! Remove stereotypes or preconceived notions from the equation. There is the old stereotype that men do not drink rosé because it is a girly wine and “real men don’t drink rosé.” We will admit that Rosés fell off the map for awhile as they were mistakenly associated with White Zinfandels or other sweet, light pink varietals. Our 2013 vintage of Pinot Noir Rosé at Dawn’s Dream won “Best Rosé of Monterey County” and we can guarantee it was not because of any sweet or girly characteristics. Rosés are making a comeback as crisp, dry, and bold wines with great structure and it is time that we all put down our wine guard and serve a bottle of Merlot or Rosé at our next dinner party. 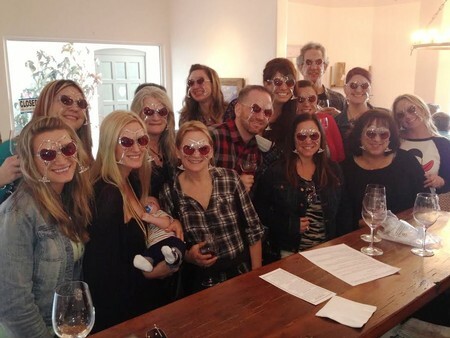 We challenge you to stand up to the power of suggestion at your next wine tasting. Be sure to consider other's opinions or expert's ratings but remember to taste deductively and find what speaks to YOU! Explore and experiment with different wines to learn what you like and dislike about a wine. Tongues are like fingerprints in that no two palates are exactly the same. “Drink outside the box” and try a wine that you never considered before…we think you'll be pleasantly suprised! Host your next event at Dawn's Dream! No matter what the occasion -- birthdays, corporate events, holiday parties, engagement parties, wedding showers, and so much more -- let Dawn's Dream be the host location for your next private event! We offer extremely affordable rates, the opportunity to hire your preferred catering company, space for up to 50 guests, and of course, all of our award winning wine varietals for your sipping pleasure. Our stunning tasting room and competitive prices will help you create an unforgettable occasion! Also available are private tours and tastings at our 700 acre family winery in Cachagua. Walk up and down the beautiful, endless rows of vines, explore the wine caves, and relax with your favorite Dawn's Dream wine while overlooking the rolling hills of Carmel Valley. Please contact Maegan in our sales office by email or phone at (831) 659-2649 for availability, pricing, and further details. 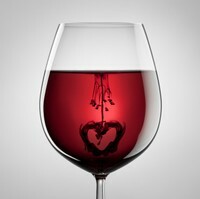 What does your wine of choice say about you on Valentines Day? "What your wine says about you" - Valentine's Day Style! Some of us look forward to V alentine's Day all year round while to other's it is just another day in February. We think that your personal wine choice may reflect your approach to this festive holiday. What do you think?? Chardonnay - You know what you want and on Valentine's Day that means nothing serious. In your mind, Valentine's Day is just another day. For you it includes a bottle or maybe even two of your favorite Chardonnay to loosen up the mood. Rosé - Is it summer yet? 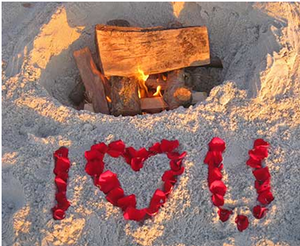 You just want to cuddle up beside your special someone and watch the sunset on the beach near a bon fire. Pinot Noir - You love roses just as much as you love wine. If you get both on Valentines Day you’ll be in heaven. Cabernet Sauvignon - You want to get away, but not to far. A dusty trail ride on the ranch is what you're looking for. Merlot – Pasta , pizza, couch, and Netflix...need I say more? Malbec - Valentines Day for you is a day to spice things up in your relationship. You want to dust off the cob webs and give your lover a little something extra this year. Petit Sirah - Forget the flowers, the cards, and all the other foo foo stuff. You just want to turn down the lights and enjoy a nice dinner fire side with the one you love most. 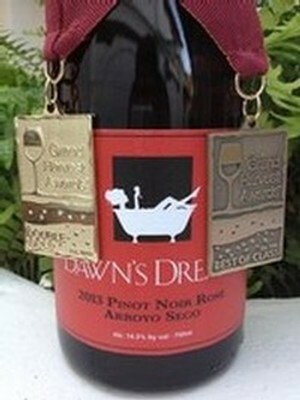 Whatever your preference on wine, we wish you a Happy Valentine's Day from all of us at Dawn's Dream Winery. Cheers! Sight - With your eyes you can find several different aspects of a wine before even smelling or tasting. You'll want to look for any flaws and or any imperfections. In a way it's similar to checking the quality of a diamond for flaws. Look for sediment, carbonation, and off colors. When examining the color of a wine, note if the wine is bright, dull, or dark while also checking the clarity. White wines typically range from pale green to yellow to deep golden brown while red wines typically have a much larger range from younger wines with a raspberry hue all the way to older wines with a mahogany hue. Next view the viscosity or thickness of the wine. You can achieve this by swirling the glass and then watching the tears fall down the glass. The slowness of the tears sliding down the glass and the thickness of the tears can help determine a wine’s range of alcohol. With thinner faster sliding tears a wine will be lower in alcohol. It's a common misconception that you can tell the quality of a wine by its "legs". Those so called legs are pure ethanol or alcohol, not a factor of overall quality or superiority. Swirl - Swirling your glass will ungulate the wine allowing oxygen to penetrate the wine. This expels the vapors, evaporating from all sides of the glass, and coats all sides of the glass to release the aroma and bouquet of the wine. Smell - Smelling is the most important part that some mistakenly skip completely or rush through. Studies have shown that 90% of tasting comes from the sense of smell. So use your sniffer and take it through these few steps. First, check for flaws in the nose such as a wine that has become corked or oxidized. This means a wine has been contaminated or “gone bad”. For example, does it smell damp, soggy, wet or like rotten cardboard? Next, test the intensity of your wine. If you can smell the wine a few feet from your nose you can say it has powerful nose. A modest nose will not be as intense and a delicate nose will be very mellow and soft. A powerful nose does not indicated a higher quality wine as all varietals are different, it depends on what you prefer. Finally, check for fruit, non fruit, and earthy characteristics on the nose. The descriptors you can use to describe the nose of a wine are endless and can range from apple to pomegranate, and from licorice to leather. Sip – One of the first sensations you will start to gauge while sipping is the amount of sweetness present in a wine. Ask yourself if the wine is more sour and sharp like a lemon or very sweet like grandmas cherry pie. If a wine is not sweet is considered to be a “dry” wine. Next you can decide the body of the wine. We’re not talking about the shape of the wine, but the way it feels. A full bodied wine will fill your mouth with good acidity and supple tannins while a light bodied wine will seem much smoother. Your mouth will react differently to acid and tannins in your wine. An acidic wine will make your mouth water. The more your mouth salivates, the more acidic the wine. Tannins in wine will leave a feeling of dryness at the finish. A wine that gives you a chalky feeling on your teeth or a slight cotton mouth is a very tannic wine. 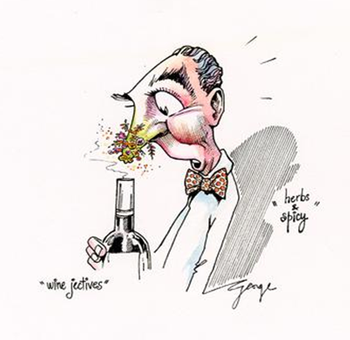 Spit - We all love to indulge a little every now and then, but note that swallowing the wine will almost immediately start to impair your senses. When tasting at several different places in one day its best to taste and spit. You will still get the full sense and taste of a wine but it will allow you to make more accurate deductions of all the wines you will taste. Don’t worry…all of the sommeliers and other wine pros are spitters too! References - Aldridge, George. 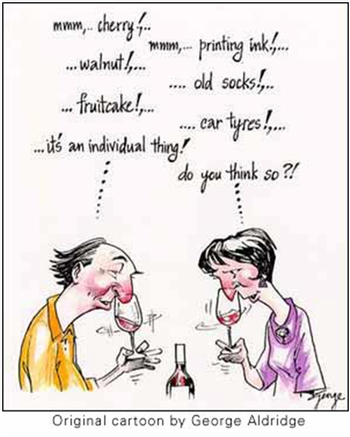 Wine Cartoon Pictures. Digital image. Wine Cartoon Pictures. N.p., n.d. Web.